Blue Sky Studios has just one franchise - Ice Age. With the introduction of a sequel to the very successful Rio, the studio is on its way to becoming a force to reckon with. However, as with most second instalments, Rio 2 is not a patch on the original, although it is enjoyable fare and has its moments. The studio's intention is to cash in on the World Cup fever, of course, and the return of the original cast is just a bonus. 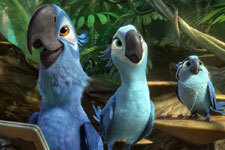 After the events of the first movie, in which Blu (Jesse Eisenberg) and Jewel (Anne Hathaway), both blue macaws, fight against the odds to save themselves from extinction, the two birds are now safely ensconced in the sanctuary that Linda (Leslie Mann) and Tulio (Rodrigo Santoro) run in Rio. Blu and Jewel have three kids ??" the music aficionado Carla (Rachel Crow), the bookworm Bia (Amandla Stenberg) and the mischievous Tiago (Pierce Gagnon). Life is good, although Jewel still yearns for the wilderness that was her home once, and Blu teaches their kids how to survive on human inventions such as pancakes and Swiss knives. Linda and Tulio are somewhere deep in the Amazon rain forest, and there they discover the existence of more blue macaws, which they thought was not possible. When this news is aired on television, Jewel immediately wants to go there and connect with others of her kind. The reluctant Blu agrees to a family vacation, and is just slightly mollified when his friends - the romantic toucan Rafael (George Lopez), the rapper cardinal Pedro (will.i.am) and the singer canary Nico (Jamie Foxx) - accompany them. Nigel (Jemaine Clement), the villain who lost his ability to fly thanks to Blu and Jewel, is now reduced to being a fortune telling cockatoo. He spots Blu and company flying over the city he now lives in, and decides to follow them, with the help of a poison dart frog Gabi (Kristin Chenoweth) and an ant-eater Charles. In the meantime, the perpetrator of illegal logging in the Amazon forest is not too happy with the plans that Linda and Tulio have for making the region a protected one. He wants to get rid of them. Blu and company arrive at their destination, and Jewel is shocked to realise that her tribe, which she thought had perished, lives there. She is reunited with her father Eduardo (Andy Garcia), aunt Mimi (Rita Moreno), and childhood friend Roberto (Bruno Mars). Now she does not want to go back to Rio, but Blu has a problem with that ??" not only is he uncomfortable in the jungle, but he also senses a certain hostility from Jewel's father. They have yet to discover that Linda and Tulio are in danger, though, and life takes an unexpected turn. 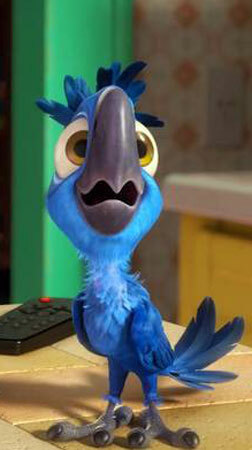 What make Rio 2 more than just predictable are the characters. While you know that the dangers are never fatal and that even the villains are funny, it is comforting to revisit some of the zany dialogues that take place between the birds and other animals. The relationship that the macaw kids share with the other species is heart-warming, and their loyalty to each other is a good lesson for children who watch the movie. The plot is however rather thin. The introduction of an audition for the carnival is contrived, especially when you realise that the blue macaws in the forest are accomplished musicians and dancers, and therefore it makes perfect sense for the city birds, in search of inspiration, to tag along with Blu's family. The antagonism between Blu and Eduardo is rather unnecessary, and the relationship between Jewel and her father is ambiguous, to say the least. The story has nothing that you have not seen before, whether in animation films or otherwise, and every sequence is just what you anticipate it will be. The most interesting character is that of Gabi, the poison dart frog. Her tragic love for the self-indulgent villain is poignant, and funny. Their relationship is the highlight of the movie. The laughs are few and far between, and some of the jokes fall flat on their face - repetition kills the moment. Linda and Tulio are not as lovable as they were in the first movie, and neither are Blu and Jewel. In fact, Jewel comes across as quite unreasonable. Blu's clumsy efforts to prove himself become quite tedious after a point. However, Roberto is a welcome distraction, and provides a smirk or two. Jesse Eisenberg and Anne Hathaway may have jumped at the chance to star in the sequel, but they sound tired, and not so interested. Maybe the script did not excite them enough, since it is a well-known fact that both are accomplished artistes. Andy Garcia is also a little subdued and so are the other cast members. It is left to Jemaine Clement and Bruno Mars then, to provide the energy that an animated feature needs. Rita Moreno deserves more dialogues. The scene stealer is, of course, Kristin Chenoweth - she sings and whines with equal fervour and has just the right voice to bring alive the character of Gabi. The technical aspects of the movie are almost flawless, but the production design is limited. The vivid colours can become tiresome after a point. The 3D is irrelevant, and the movie can work quite well in 2D, too. The 2D animation of the birds flying across the continent is monotonous and stretched. Although the length of the movie is under 2 hours, it becomes tiresome to sit through it after a point, and for that, the editor is to blame - even the blue macaw tribe dance is uninspired. The main hero of the movie, besides Kristin Chenoweth, is the music, which is not too original, but provides welcome relief and is foot tapping. Rio 2 does not seem to be made with much effort, but it is a movie that children will enjoy watching. Clearly made for under-10s, the film has just too much happening, and at the same time, nothing memorable stands out (except Kristin Chenoweth, of course). Watch it only if you feel the need to be loyal to a franchise, and expect to be disappointed with the climax and resolution. Be the first to comment on Rio 2! Just use the simple form below. fullhyd.com has 700,000+ monthly visits. Tell Hyderabad what you feel about Rio 2!